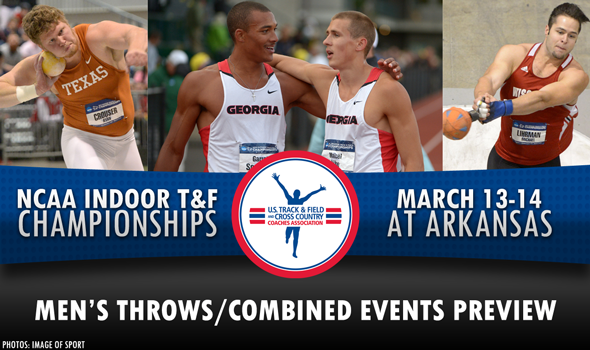 The NCAA Division I Indoor Track & Field Championships are this weekend – March 13-14 – in Fayetteville, Arkansas, so to get you ready we’re breaking down each event at the Championships. Here we look at the men’s throws and combined events, and we will take a look at those same women’s events in a separate article here. Be sure to tune in live on Friday and Saturday to ESPN3 (WatchESPN) to witness one of the best and most tightly contested indoor track & field meets on the planet. For full meet details, visit the USTFCCCA National Championships Central page, and be sure to check out the USTFCCCA’s newly launched NCAA Division I Indoor Track & Field Championships History Record Book page. Though it has been overshadowed by its weight throw cousin (more on that in a moment), the men’s shot put has been a very deep event in 2015 that has flown under the radar. The farthest an eighth-place finisher has ever thrown at the NCAA Championships was 63-6 (19.35m) just last season. This year, the entire field is seeded farther than that. Once again, defending national champion Ryan Crouser of Texas is poised to collect his fourth career national title. The senior is peaking at the right time, heaving a season-best 69-4¼ (21.14m) to win the Big 12 and take the collegiate lead by more than half a meter. He owns the top four farthest throws of the collegiate season. This will be Crouser’s final opportunity to chase the indoor collegiate record books. As dominant as the Longhorn has been, he’s not yet cracked the 70-foot barrier indoors and is an agonizing half-inch away from the all-time top-10 collegiate performers list. Anything goes throughout the rest of the field, though Florida’s Stipe Zunic has some momentum building after making the final in the shot put at last week’s European Championships with a career-best heave of 20.67m. Darrell Hill of Penn State, Ashinia Miller of Georgia and Jonathan Jones of Buffalo have all been over 20 meters this season, with Jones having accomplished that feat most recently at the MAC Championships two weekends ago. All the way down at No. 16 on this list is Stephen Mozia of Cornell. Can last year’s indoor and outdoor runner-up turn his season around at exactly the right time? No athlete in the country has been as dominant this year as newly minted collegiate record holder and defending national champion Michael Lihrman of Wisconsin in the weight throw. He’s more than a full meter clear of second-ranked Chukwuebuka Enekwechi of Purdue, a man who’s ranked second not only in 2015 but in the entire history of NCAA Division I weight throwing. He’s thrown nine of the top-10 marks in collegiate history this year alone, including his collegiate record 83-11¼ (25.58m) to win the Big Ten Championship by nearly two full meters over Enekwechi. That’s a victory of 8.34 percent. If that were the NCAA Championships final in which he had done that, that would have been the fourth-most decisive victory in event history. He’s shooting for the world record of 84-10¼ (25.86m) currently held by Lance Deal of the United States from 1995. There’s a lot of space in between Lihrman and Enekwechi on the descending order list, and there’s just as much in between Enekwechi and the rest of the field. An intriguing dark horse in this event is Southern California’s Conor McCullough, who was the nation’s farthest weight thrower and No. 2 outdoor hammer thrower in 2012 as a frosh at Princeton, though he didn’t compete at the NCAA Championships in either event. As a senior at Southern California, he will enter the championships seeded No. 3 at 77-5¼ (23.60m) – just four centimeters shy of the all-time collegiate top-10 performers list – with just two meets under his belt in 2015. Using the current implement (a different one was used in 2001 and 2002), this could be the deepest weight throw ever. Eight men are seeded farther than 74 feet (approximately 22.55m); no weight throw final has ever featured more than four who have attained that measurement. Two years ago, the Georgia duo of Garrett Scantling and Maicel Uibo were the highest-scoring third- and fourth-place finishers in the history of the NCAA Championships in one of the deepest fields the meet had ever seen. This year, they’re the heavy favorites to finish first and second. Scantling moved up to No. 9 on the all-time college heptathlon performers list with an SEC-winning score of 6036, followed closely by teammate Uibo at 5909. Uibo, who won the outdoor decathlon last year over former champ Johannes Hock of Texas, is currently the No. 8 heptathlete all-time with his runner-up 6044 at last year’s NCAA Championships. A 1-2 sweep for the Bulldogs would be historic. Since the first NCAA Championships heptathlon in 2004, no team has swept the top two spots, with the Texas duo of runner-up Donovan Kilmartin and third-place Trey Hardee coming the closest in 2005. If not for a DNF in 2006 by Hardee, that duo would likely have accomplished the sweep: Hardee had a commanding lead through five events before missing the final two components, allowing Kilmartin to come through for the win. No one else is within 100 points of the 2015 Georgia duo, with Mike Morgan of Buffalo the closest at 5797. The No. 3 heptathlete of the regular season,Reinis Kregers of Kansas State with 5801 points, is not entered in the field. Morgan is in the same scoring neighborhood as six other men who have scored more than 5700 points this season.